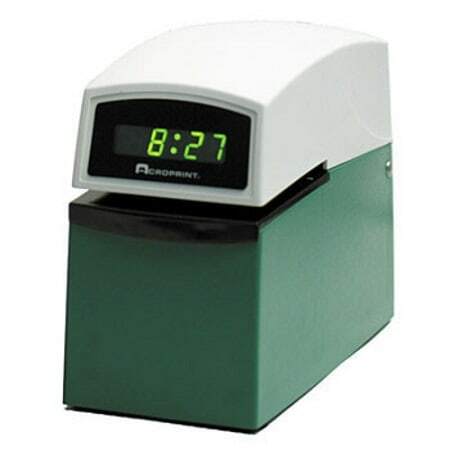 These Acroprint ET Time Date Stamps with digital clock face durable time and date stamps are used by businesses worldwide and are suitable for most business environments. The E Series stamps are ideal for virtually any time, date or number stamping application. The E-series stamps' heavy-duty construction withstands harsh environments and hundreds of print registrations per day. All units are rust and corrosion resistant and are made in the USA. Standard typewheel configuration: year, month, date, time. Custom typewheels available by special order. Sharp, clean imprints that can penetrate multiple copies. Rust and corrosion resistant cases stand up to most business environments. ETC model includes a bright, easy-to-read digital display. Optional custom-engraved stamping plates available.